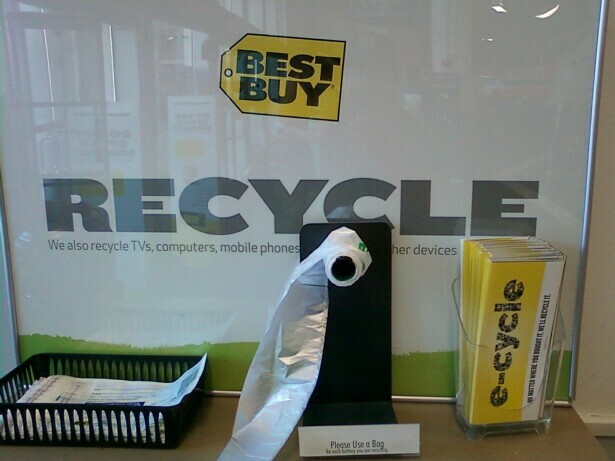 Electronics superstore Best Buy has made a concerted effort to go green. But as a recent trip revealed, each store is different in terms of their knowledge and implementation of company policy. The other day I visited the Westwood store to recycle my electronic waste, but I was told they could only take two items because they are charged for each electronics item they recycle. I was however able to recycle all my used batteries and used CDs, DVDs and jewel cases in designated receptacles near the entrance. But I still had two bags filled with used electronics so I visited the store at Pico and Sawtelle in West L.A. and after I was given recycling stickers to place on my bags the customer service representative took everything but my light bulbs. So one store would only take two items and the other store took everything. One of these stores was right and I hope it is the second store. Either way, I'm glad I was able to recycle all my e-waste. For more information on Best Buy's "e-cycling" program visit www.bestbuy.com/recycling. Best Buy is also promoting electric vehicles. I picked up a pamphlet that featured electric scooters, electric bicycles and electric motorcycles for sale. For more information visit www.bestbuy.com/electricvehicles.